To what extent do ‘renewables’ depend on finding sources of non-renewables? Mining is involved – the raw materials have to be found and extracted from the earth. 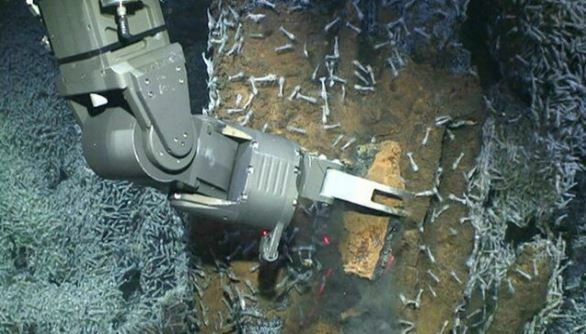 British scientists exploring an underwater mountain in the Atlantic Ocean have discovered a treasure trove of rare minerals, reports BBC News. Their investigation of a seamount more than 500km (300 miles) from the Canary Islands has revealed a crust of “astonishingly rich” rock. Samples brought back to the surface contain the scarce substance tellurium in concentrations 50,000 times higher than in deposits on land. Tellurium is used in a type of advanced solar panel, so the discovery raises a difficult question about whether the push for renewable energy may encourage mining of the seabed. The rocks also contain what are called rare earth elements that are used in wind turbines and electronics. Using robotic submarines, researchers from the UK’s National Oceanography Centre found that the crust is dark and fine-grained and stretches in a layer roughly 4cm thick over the entire surface of the mountain. He has calculated that the 2,670 tonnes of tellurium on this single seamount represents one-twelfth of the world’s total supply. And Dr Murton has come up with a hypothetical estimate that if the entire deposit could be extracted and used to make solar panels, it could meet 65% of the UK’s electricity demand. But Dr Murton does want his team’s discovery, part of a major research project called MarineE-Tech, to trigger a debate about where vital resources should come from. “If we need green energy supplies, then we need the raw materials to make the devices that produce the energy so, yes, the raw materials have to come from somewhere. “We either dig them up from the ground and make a very large hole or dig them from the seabed and make a comparatively smaller hole. Man has progressed for at least the last 43,000 years in part from his abilities in mining and digging (see https://en.wikipedia.org/wiki/Ngwenya_Mine). Man is the mining Ape! As a part of nature man has survive and flourished partly because of his natural ability in toolmaking, and to mine for the resources he requires for this task. This find should be exploited but done efficiently and with due consideration for the surrounding fauna & flora. “Demand” is the operative word (like antiques, there is no real value without buyers), but more importantly, has anyone seriously looked into the number of sun days during the Little Ice Age? What kind of weather are we expecting to have during the next grand solar minimum? I still think Sir Hoyle was basically right when he published his energy analysis, Energy or Extinction, in 1977. Of course at that time it was not so widely known the earth makes petroleum and gas as part of the geological processes driven by the solar flux. Fred assumed there was a finite amount of petroleum to be extracted, based on the ridiculous notion it all came from from decaying organics. Instead of focusing on these exotic forms of energy conversion using rare elements, wouldn’t it make more sense to establish how a solar minimum (it’s going to get COLD) will impact the production of our existing resources? Coal and thorium are still in plentiful supply…..
China may spend quite a lot on renewables but is also into coal gasification. Tellurium trades at about 17USD/pound. Yawn. Not particularly incredibly special and valuable. Rare earths and some fissile materials are not particularly rare. Thus thorium is present in large quantities in the rare earth ores. It is also 99% fissile compared with 0.7% for uranium ores. AlecM’s numbers are rather unconventional. I loved the comment “…if the entire deposit could be extracted and used to make solar panels, it could meet 65% of the UK’s electricity demand”. a clever insertion of disinformation that makes the reader think that solar panels in the UK could ‘meet 65%’ of the UK’s ‘energy’ demand. Energy demand is not the same as electricity demand, and solar panels are hugely inefficient in the UK and of course only work when the sun shines. But I guess the average BBC reader would swallow it whole. Doesn’t matter how efficient solar panels and wind turbines are, they don’t work under heavy snow. Richard – to state the obvious, solar panels don’t work after dark either, and do very little under grey skies in northern latitudes. They seem to be on their last legs in the UK. Alec, thanks. 99% of Uranium is U238 which can be converted to fissile products in a breeder reactor.